The first notes from Shadowland by LA based Deep Eynde remind me immediately of Iggy Pop. In fact, Deep Eynde describe their style as dark punk and South Californian devil punk which means that it's a mixture of 70s US punk and 80s new wave vibes. All musicians started in various bands and they all have a different goth past. 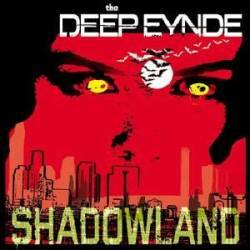 Although Deep Eynde are now more into punk, they can't deny their past. Parallels to The Damned, Misfits, Iggy Pop or The Lords Of The New Church come back on nearly every song. Goth and punk don't seem to coincide very well, but Deep Eynde master this quest without greater difficulties. Especially the faster Space Invaders, drawing parallels to Samhain or early Misfits, is the best track on the album. A welcome diversion is Society's Parasite where Deep Eynde just play a simple but melodic pop rock tune. In general, Shadowland is a punk album that contains melodic as well as aggressive parts, without losing its dark undertone. This album may be recommended to everyone who wants to organise a ghoulish zombie party at home. It's the ideal soundtrack for your decoration of skulls, bats, skeletons and candles.